Leyte was commissioned in 1846, and built in Newport News, Virginia. She was a 27,000-ton Ticonderoga aircraft carrier. She cruised the South Pacific initially, and then was sent to work with the Atlantic Fleet for three years. She deployed four times to the Mediterranean in 1947, 1949, and 1950, and then was sent to help the Navy with the Korean War. She remained off the coast of Korea from 1950 until 1951 and hosted a Medal of Honor recipient and provided 4,000 deployments of aircraft to help ground troops. In 1951, Leyte returned to the Atlantic, where she spent the rest of her career in service. There were two more deployments to the Mediterranean between 1951 and 1953, and then was converted to an anti-submarine support and reclassified as a CVS-32. In the Boston Naval Shipyard in 1953, she was in the process of being converted when there was an explosion and fire. This killed 37 men and injured dozens more. However, she still returned to duty in 1954 and worked in the Caribbean and Atlantic for the next five years. 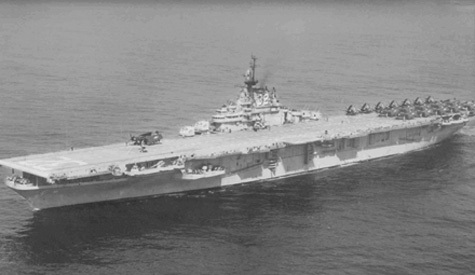 She served as an amphibious assault ship for a short period in 1957, replacing her fleet with Marine helicopters. Leyte was decommissioned in 1959 and then re-designated as an aircraft transport vessel, remaining on reserve for 10 more years before being sold for scrapping in 1970.